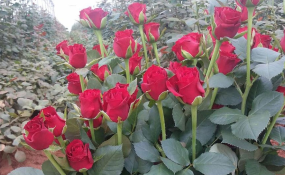 As the world readies to mark Valentine's Day on February 14, flower growers are a worried lot as fertiliser shortage arising from delays at the Mombasa port continues to bite. Over 1,000 tonnes of calcium nitrate meant for flower farms are still lying in Mombasa awaiting clearance by a multi-agency team. Farmers say if the situation is not addressed, flower exports as well as local supply will be affected. With the looming shortage of flowers, Sunday Nation has learned that prices will be hiked ahead of Valentine's Day. The multi-agency team headed by Deputy Head of Public Service Wanyama Musiambo was formed to clean the Kenyan market of illicit goods and prosecute graft. It is yet to clear the fertiliser consignment meant for flowers. "We are really concerned over the slow pace at which this multi-agency team is taking in clearing goods at the port. This problem is not only affecting the flower industry, but other sectors as well," said Mr Eustace Muriuki, the chairman Fertiliser Association of Kenya. Mr Muriuki said the farm input has been held at the port for more than four months and pleaded with the government to enact other measures that will see clearance expedited. He added farmers have been compelled to use other fertilisers that are not good for flower farming while others have not top-dressed. "As fertiliser traders, we are normally issued with Certificate of Conformity (CoC) to show the compliance of the shipments. It provides the Kenya Bureau of Standards and customs with proof that the goods being imported are in compliance with the relevant standards and technical regulations," he said. However, despite producing the document, he said, importers are still subjected by the team to another clearance process which takes time. The team, consisting of Office of Director of Public Prosecutions, Ethics and Anti-Corruption Commission (EACC), Kenya Revenue Authority, National Intelligence Service, Financial Reporting Centre, Asset Recovery Agency and Directorate of Criminal Investigations, is mandated with safeguarding standards of investigation and citizens' interests. Horticulture sub-sector is one of the top foreign exchange earners for the country with the cut flower exports earning the country more than Sh80 billion last year. Sh42.6 billion was earned in the first four months of 2018, a 40.4 per cent increase over the same period last year, according to data issued by the National Bureau of Standards. Data from Kenya Flower Council place Kenya as the world's fourth-largest exporter of cut flowers behind the Netherlands, Colombia and Ecuador, and makes up some 7 per cent of global market share. Products are exported to 60 countries worldwide; some 59 per cent of domestic production is routed through the Netherlands' flower auction, accounting for about 35 per cent of all flower sales in EU markets, while other key markets in terms of exports include the United Kingdom, Germany, Norway and Australia. Meanwhile, the fertiliser association said it is ready to supply farmers with the produce they need for this year's long-rain planting season. Mr Muriuki said the private sector normally imports 100,000 metric tonnes of fertiliser while the government brings in 50,000 metric tonnes of the subsidised product. He said, "We are ready to fill the government's gap since it has said it won't supply farmers this season with subsidised fertiliser. However, all we want is to be assured that it will not go behind our backs and import after we have already brought ours." He said if this happens, they will be compelled to sell theirs at half-price, which automatically results to a big loss. "We can only be able to bring the commodity through the specially permitted system under Article 114 of public procurement which can only be permitted by the National Treasury. There are no short-cuts to these unless one wants to land in jail," said Agriculture CS Mwangi Kiunjuri. He noted that the fertiliser should be at the National Cereal and Produce Board county depots by now because farmers are already preparing their lands for planting. Agriculture PS Prof Hamadi Boga had last year proposed the introduction of the e-voucher for farmers to root out fraud.